Last Saturday I was able to sew the majority of Colette Pattern's Hawthorn blouse in one sitting. Of course, for me at least, sewing a blouse in one sitting means a couple of mistakes are guaranteed to happen. I guess that this is technically a wearable muslin, as I didn't make an official muslin. Kind of crazy for me seeing as I am a stickler about making muslins. Apparently, I am "living on the edge" with this sewing project (I'm so wild). I had a lot of this Betsy Johnson fabric from Mood, so I figured that if the fit was a total nightmare I would just make another blouse. After tracing the pattern I made a FBA to the paper, but did not make the excess fabric into a bust dart, which I should have. It seemed to throw off my button placement, which I just redrew... incorrectly. Where the peplum attaches to the rest of the blouse there is a gap because there isn't a button and it looks weird on me. After reading about Lauren's sewing tricks I am totally going to steal her idea and put in a hook and eye at the waist and just know that this blouse is going to have to be worn with a belt. When I make this pattern again I am going to make a few changes. One, I think I need a bigger FBA. Two, make a side bust dart. Three, actually put the buttons in the correct spot. These changes need to be made because I need a sleeveless version of the dress. I just ate a peanut butter and jealous sandwich looking at all the cute versions on the Flickr page. Your too freaking cute!! Love! It looks REALLY cute to me! Ew, I wasn't planning on making the blouse version but now I'm really second-guessing that decision. Peatnut butter and jealous sandwich, indeed! It looks great, the fabric is a perfect match for the pattern. Love the buttons too, pearly! The fit looks spot on! The sleeves especially look impressive. Just goes to show, we are always our own biggest critics . . .
Ahhhhh, this is totally freakin' fab! I can't see any of the problems that you're describing-- it looks awesome and the print and style are so you! Love it!!!!! It's so cute! I just bought this pattern and am dying to sew it up... Just have to finish a quilt and a doll for baby girl's birthday first. Your hawthorne looks amazing :) well done you!! 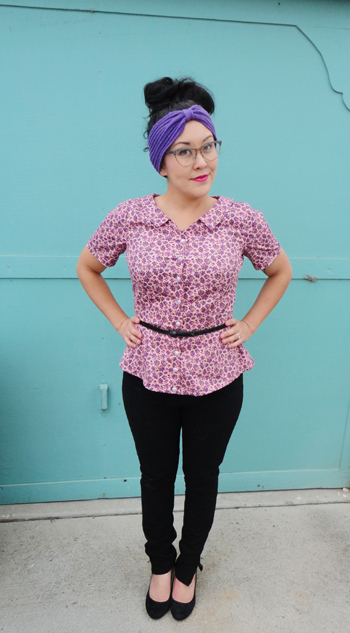 Wow this is the second Hawthorn blouse I have seen and both have made me reallllly need to sew one up myself! It looks so gorgeous with your skinny trousers- and I LOVE your fabric choice! I have made a toile of the dress and I plan to split the dart between waist and bust dart too as I think it will make the whole bodice more balanced. This looks seriously epic on you- I honestly can't see any of the issues you mentioned. Perhaps your rad stealth fabric has indeed worked its magic? I love this blouse! The fabric and style is lovely on you. On a side note - I love your headband too. Such a cute style! love love love it! great fabric and buttons and styling. i think it looks great with the belt. you could even make a self fabric belt and that would look really cool. also 'peanut butter and jealous' hahaha! that's awesome. 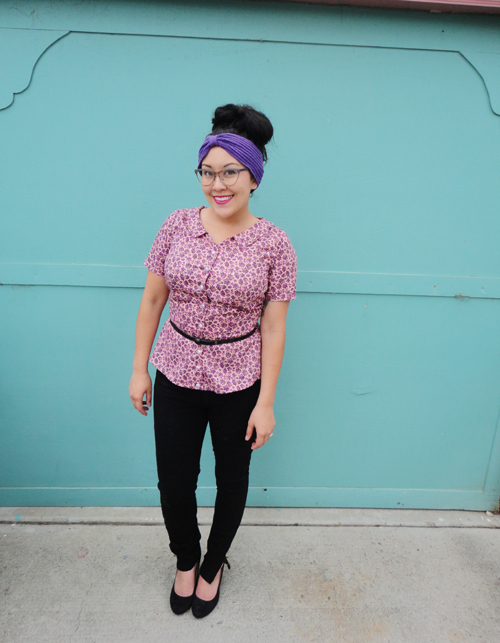 I didn't know if this pattern was for me, but I absolutely love it in blouse form! Wonderful! Oooh good idea! I didn't even think about making a self fabric belt! I told you I was wild!!!!! Thanks, Ami! I can't wait to see your version, you sew the most beautiful clothes. A magical shirt, I love that! Thanks, Nicole! Isn't quilting fun? Thank you! I love your version too! Oh I didn't realize it was knit! I'm looking on my phone and it looks almost velvety. I might have to try and knit one for myself. Thanks for the inspiration! everyone has been doing this blouse and the dress.. it's really making me want to try it out! This outfit is beyond adorable. You should! It's a great pattern! cute cute blouse :) ...im new to this FBA thing, what is it? I love it!! The print looks great with this blouse. One of my favorites that I've seen so far!